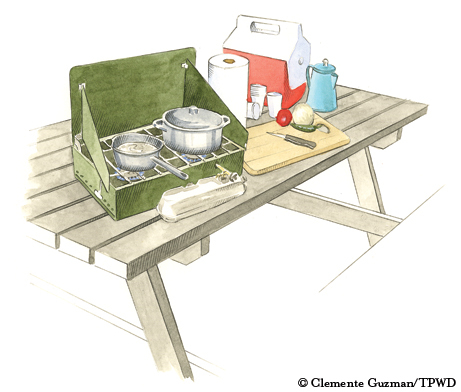 ﻿With the right equipment, you can prepare great meals at your campsite. ﻿﻿﻿﻿﻿﻿﻿Camping is a terrific way to experience Texas’ natural wonders. Whether you are putting up a tent or staying in a cabin, food must be provided for the hungry hordes after a busy day outdoors. After many trips, my family has compiled a list of equipment needed to pull off those al fresco meals. A camp stove and fuel are first on our list. We use an inexpensive two-burner propane stove that’s compact and easily set up on a picnic table. These can be purchased at any outdoor store ($40 and up). Unless you can twirl a stick to get a spark, you will need a lighter for the stove. We take a barbecue lighter, with plastic-bagged matches for backup. Must you have fresh coffee in the morning? Then purchase a camp coffee pot ($20 and up). Most families own an ice chest. Choose the smallest necessary to hold your cold stuff. Freeze water in gallon and half-gallon plastic jugs to cool your chest. These last longer than bagged ice and keep food from getting soggy. Almost all other equipment can come out of your kitchen. Several basic pans can handle most menu needs. You can fry up the bacon or fish in a black cast-iron skillet. We also take two pots — one large and one medium with lids — for heating food and water. For food prep, throw in a small cutting board, a paring knife and a chopping knife. Add a large stirring spoon or two, a spatula and perhaps a pair of tongs. Don’t forget a can opener (as we have many times!) and a handful of quart zip-close bags for leftovers. For dining, you can go two ways. We camp enough that we have invested in a plastic box loaded with plastic plates, bowls, cups and utensils. If you aren’t sure about this camping thing yet, use disposable dishes. After cooking comes dishwashing. We use two fair-sized plastic containers, one for washing and one for rinsing. These can hold dirty dishes until you’re ready to wash. The pots can also work as dishpans, albeit small ones. Of course, you need dish soap, a rag and towels. Bring an inexpensive plastic tablecloth to cover the picnic table and a large roll of paper towels. Toss in trash bags. I like the small bathroom-size bags or plastic grocery bags, as I prefer to dispose of trash frequently. For packing trash out, you’ll need larger bags. Hands can get really dirty out there. My aunt used to hang a water jug next to some pantyhose holding bar soap. That was creative, but we just bring a hand soap dispenser. We pack cooking gear in a large plastic container with a lid and put nonperishable food in another. Cardboard boxes would work but are not waterproof. This innovation occurred to us after years of rooting through collapsed grocery sacks in the back of the car. Be sure to bring some gallon jugs for water. Many campgrounds — but not all — have potable water at each site or at a centrally located place. Another recent addition to our list is a five-gallon water cooler. On a hot day, we really appreciate having a ready supply of cold water (we add ice). Don’t travel with it full, as it may slosh. Of course, this is a convenience, not a necessity. Two final, intangible, very important items are required on camping trips: ingenuity and flexibility. You are camp cooking in the great outdoors, after all. Things can and will go wrong. Prepare as best you can, make do when needed — and have fun!